My top 10 go-to places in Galway! Last year Stellar magazine featured my favourite places to go in Galway, and most recently County Living Magazine did a similar feature, so I thought why not share them on the blog! 1. Sunday Brunch - Kai - This is my favourite restaurant in Galway. The food, atmosphere and service are excellent. Their Sunday brunch is amazing but be prepared to queue (It's worth it!). 2. Friday Night Drink - Tribeton - this is a fab new venue in Galway City. Atmosphere is modern and chic! Obsessed with their bathroom sinks! 3. Lunch Date- Ard Bia - The food is always fresh and scrumptious, deserts are excellent and there is a little shop inside where you can buy some healthy ingredients. I also love The Kitchen which is next door! The food is great, the service is excellent and they are really baby friendly! 4. Beauty Treatments – Shelley’s Beauticians- Shelley’s offers some of the best treatments in town. The girls that run it are really cool, they do the best shellacs! 5. Hair - Laura at Raymond Skelton - Although it’s a little bit out of town it’s definitely worth the trip, they are really good with colours and cut and are known for their creative up-styles. There is also Angela Silkes beauticians upstairs, which is another spot well worth a visit. 6. Unique Buy - Twice as Nice- Specializing in vintage clothing, modern and antique jewellery, linen and lace - the ideal gift shop. 7. 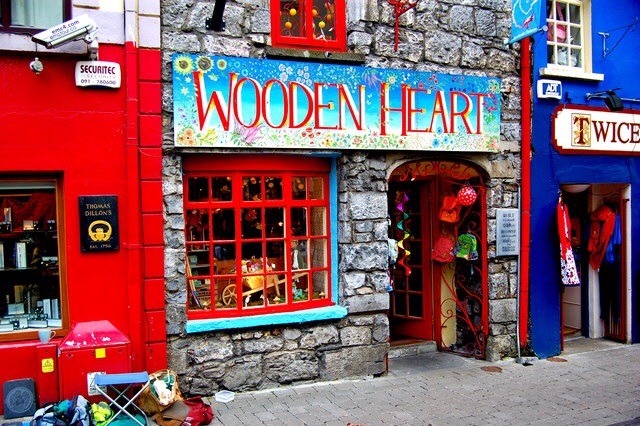 Cutest Shop - The Wooden Heart is a favorite of mine (and Bobbys!!!). They sell the most beautiful authentic children toys. 9. Splurge - Brown Thomas - Having added a lot of new labels to their Galway branch, BT is my go-to place when I want to treat myself!